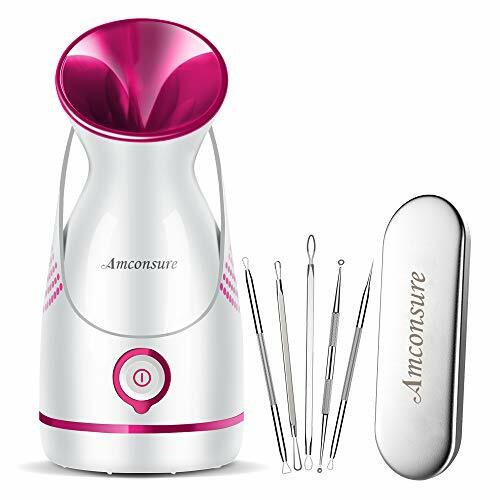 What Can Amconsure Facial Steamer Do for You? Removes congestion in the sinuses. Naturally deep cleansing to purify the skin, boots blood circulation and prevents the signs of ageing. Allows you the forget the stress of the day for a while. Adds moisture to your room so acts as a humidifier. 1. Before using the steamer for the first time, please let it run with a full tank of water for removing a bit of smells from manufacturing. 3. The distance between the steamer and face should be 7-8" inches (20cm) when steaming. A full tank of water can be steamed for about 8-10 minutes. Super Strong Amount of Mist, Deep Hydration Amconsure facial steamer is a new type of steamer that generates nano-ionic steam,Full-Powered Steam only within 30 seconds, turns clean water into Micro-Fine particles to produce a powerful, consistent mist. The mist of this face humidifier is warm and safe to smell, no harm to your skin, you can enjoy a relax steaming with consistent mist for 10 minutes. Nano Facial Steamer Compared to normal face steamer :The hot mist opens the pores, removes the skin toxins, cosmetics residue, easy to clean, removes makeup, deep penetration, full of water molecules directly to the skin deep, beauty from the outside, promotes the absorption of skin care products, delicate skin, skin care products double, remove skin aging The stratum corneum promotes skin metabolism, activates cell vitality, and nourishes skin care. Perfect Gift.Free 5-Piece Blackhead Extractor Kit Amconsure Facial steamer design with Perfect body, compact size and light weight.One touch button for easy operation.Small body for your convenience to use anywhere like living room, washroom, or bedroom.Free 5-Piece Blackhead Extractor Kit Followup your steaming session by using this kit to unclog pores, remove blackheads and blemishes effortlessly for perfect skin after every use. ULTRASOUND NANO SPRAY Working principle Hi-Tech chip controlled mode and Special Process shock technology, makes water spilt.Water penetrates into the deep. 1)Hydrating comprehensively. Be used for care of face, body, hair or other position. It is quite nifty and works well to set and refresh your makeup. 2) Using USB charging, simple to use. 3) Four reasons using. The Facial Mister make you feels relaxing and cool on a hot day, and helps the skin stay hydrated during the winter season. Moisturize and Refresh your Skin: This small face nano mister is used for care of face, body, hair and other position. Suitable for all kinds of skin.Perfect for keeping your face hydrated and healthy. Restoration: Using facial mask and facial massage will stimulate the skin after sunburn. Pores open or skin feels painful and itchy. Turn on the product for a few minutes, skin will recovery fastly. All seasons using. This handy portable face steamer sprayer make you feels relaxing and cool on a hot day, and helps the skin stay hydrated during the winter season. USB Charging, Simple to use, Pocket size. Just filled it up with water, push down the switch, and then it automatically sends out a nice mist. The handy steamer is mini size, you can put it in your handbag, purse, schoolbag and even pockets and use it anytime though for a quick little hydration boost of your skin. 20ml-large water tank. A box of water can be used more than 8 times with large amount of mist. Charge once, can spray about 50 times. Full face steamer for intensive skincare and inhalation attachment for nose and mouth inhalation to clears your blocked nose,humidifier function. Suitable for all type skin -A relaxing stream of warm mist covers your whole face with its finely tuned nozzle, quickly opening up pores to thoroughly remove makeup, dirt and other impurities from skin. A simple push generates superfine steam particles, 4000 times finer than ordinary steam, to penetrate deep into skin and replenish natural moisture, leaving your face exceptionally hydrated. Facial steamer with exquisite package : With an exquisite package and practical blackhead pimples and acne removing effectiveness suit, the best gift for your relatives or friends. No Worry Anymore! LONOVE Facial Steamer is design to gives you hydrated skin and a glowing complexion! Relax & indulge as luxurious micro-steam technology hydrates and purifies the skin in one simple step, revealing a dewy and soothed complexion in as quickly as ten minutes.Allows you to forget the stress of the day for a while.Which gives you exactly what you want for a home spa face steaming experience! What Can LONOVE Facial Steamer Do for You? LONOVE Facial steamer can bring back your beauty, make you confidence all the days with a clear face. 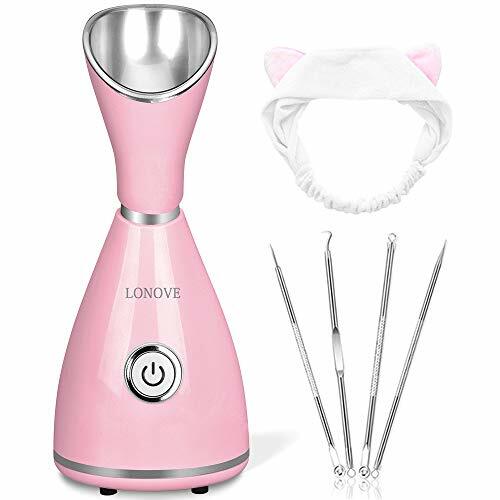 How to use LONOVE Face Steamer? Step 2:Pour the water from the measuring cup to the tank ,tighten the nozzle and tank by clockwise(to the left). Please Note: Before steaming at face for the first time, please let the steamer run through a full cycle with a few drops of lemon juice added into water to remove smell. 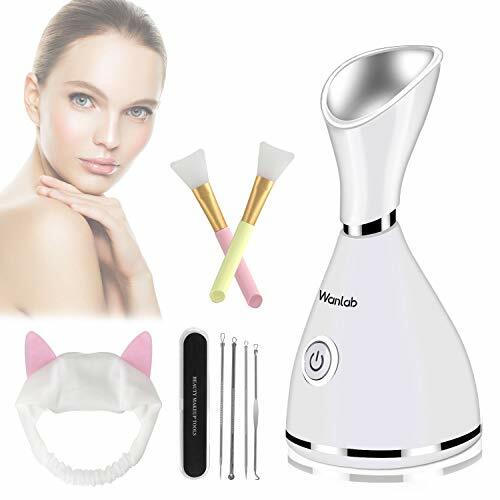  Muti-functional, Professional Facial Treatment Our face steamer not only helps dry skin by adding moisture, opens pores to allow better penetration, but also can reduces acne and blackheads, weakens pigmented spots, removes congestion in the sinuses. And Warm Mist also can naturally deep cleansing to purify the skin, boots blood circulation and prevents the signs of ageing. Allows you to forget the stress of the day for a while. GET ONE HOME AND STEAM YOUR BEAUTY NOW!  10 Times Penetration than Regular Steam,but Silent operation. The normal steamer can only add water on your face surface, which can not penetrate deep into pores. While LONOVE Nano Steamer breaks down water into nano particles,,which is up to to 10 times more effective at penetrating your skin, meaning you enhance your blood circulation by as much as 10 times, improve your skin cell functions and help to retain your youthful complexion.  Super Strong Amount of Mist, Deep Hydration Full-Powered Steam only within 30 seconds, turns clean water into Micro-Fine particles to produce a powerful, consistent mist. The mist of this nano steamer is warm and safe to smell, no harm to your skin, you can enjoy a relax steaming with consistent mist for 10 minutes.And the Steamer will auto-off when the steam finished.  Real Strong Nano Ionic Steam Instead of Water Vapor Our facial steamer designed with built-in Atomizing Lamp to ensure real nano steam. But others similar facial steamer on the market are do not have the built-in atomizing lamp,because this is our own Exclusive Technology. Without atomizing lamp, the steam which coming out is water vapor.It can not be penetrated in your skin and it is hot or even burn your skin. Only real Nano steam can be deeply penetrated and improve your skin quality.  Why Recommend LONOVE Facial Steamer to You. Compare to other brand's external water tank, LONOVE nano facial steamer designed with built-in water tank, which is not easy to damage and overflow the water,more safe when steaming. Meanwhile, It comes with free blackhead remover kit and the hair band,more convenient to use them together. Absolutely a PERFECT GIFT!Trustworthy 15 month warranty, back up with best after-sales service. Say hello to your new best friend-LONOVE facial steamer! 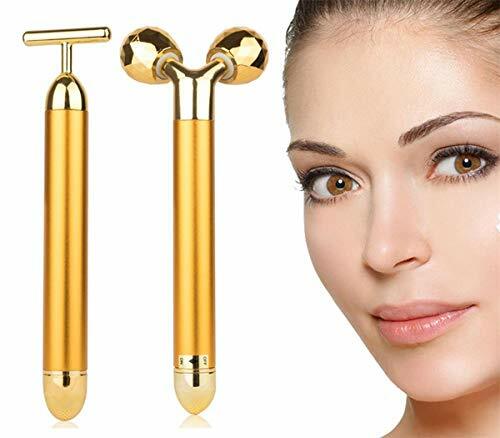 The beauty bar is magical with two changeable heads, includes 3D roller massager and "T"
long as you would be not satisfied with it. 2-IN-1 MULTIFUNCTION: The face massager kit is magical with two types of beauty bar. One is 3D roller face massager, the other is "T" shape electric energy beauty bar. Enjoy your skin care time with them. NEW TECHNIQUE: 3D Roller Electric Sonic Energy Beauty Bar is so wonderful with surface diamond-grade cut small diamond shape and unique 3D V type design to fit the whole body tighting curve. T shape head is designed for 6000 vibrations per/min and is good at tightening skin. RELAXED BEAUTY YOURSELF: Daily use of the beauty bar will make your face and skin look healthier and younger by reducing wrinkles and removing dark circles. Moreover, it will increase skin metabolism through stimulating your blood circulation,resulting in an instant face lift. Also, it can combine with skin care products and promote better absorption. 360 WATERPROFF DESIGN: You can enjoy it while showering due to the special 360 waterproof design. Moreover, the 360 T shape and 3D roller massager allows you to use the product on any part of your body from the angle that you prefer. What's more, you can use the electric massager whenever and wherever because of its portable design and the included delicate storage bag. NOTE: Requires one AA battery (not included ),electric power driven, stable performance,good circulation. Besides, Manual control Twist On/Off . Firming skin, nourishing nutrition How to use the facial steamer? Effectively Deep Moisturizing: Compared to normal steam, kingsteam take the advanced PTC ceramic heating element to vaporize clean water and produce abundant and consistent hot mists in seconds, which can more easily penetrate the skin barrier, Moisturize skin more quickly and absorb nutritional essence more effectively. 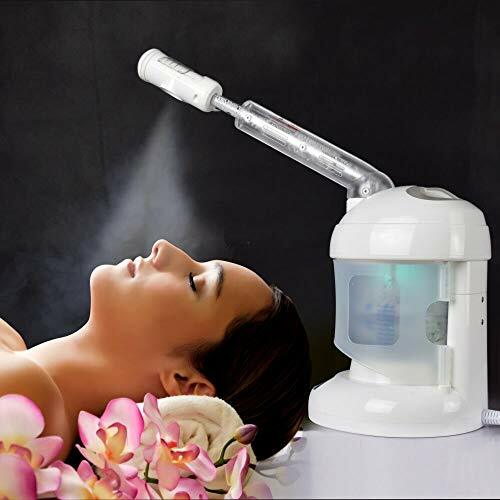 Ozone Steamer: Inside UV light sterilizes steam so that it can reach your skin with purest most effective condition, High-tech ozone function is provided to sterilize. Extendable Arm and 360 Rotatable Sprayer: You can adjust the length of arm and the angle of sprayer according to your needs, you just only stay there and enjoy a perfect facial spa. Safety and Guarantee: The professional facial steamer will turn off automatically when water is lower than probe and alarm until you press OFF button to unplug the device, your safety is always our priority, if for whatever reason you don't love our kingsteam, let us know within 30 days, and we can give you a full refund or send you a replacement, you can just buy with confidence. 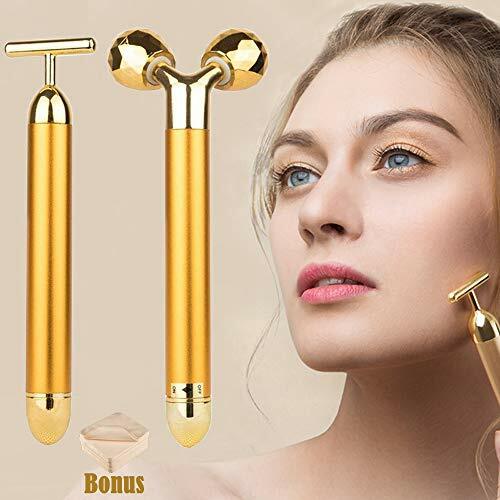 T shape sonic massager and 3D 24k gold face massager roller package combination,an electric-powered massaging facial vibration beauty implement.The perfect amount for facial and body care,fit for as perfect gift. Manual Control:Ergonomically designed massage beads, Waterproof 3D face massager roller.vibration face roller with 360 degrees rotate design adept the whole body skin. 3D Face Roller, eco-friendly no harm to the skin. Beauty Massage:With new kneading technology, relieve sensitivity skin, promotes face-lift skin tightening, body shaping, and improves blood circulation, alleviates tension. 3D roller face massager can prevent the aging, skin Tightening, massager for body, face, arms, legs, buttocks and back it can achieve effect of face slimming. Safe and Healthy:Gathers energy by mini solar panel on the main body, releases micro solar currents of when massaging.Face Roller Massager, can be used for facial care and body care. Through fine cutting, grinding diamond grade diamond face, with 70 degrees V roller structure perfect fit the human skin. Using the principle of human engineering, the radian angle of the handle radian is 97.3 degrees, and when the body line is used, the utility model can be naturally pushed, without the influence of angle, and realizes the complex comfortable kneading manipulation of the professional masseur. Please feel free to contact us if you received damaged product,refa roller lack of parts,or any other problems. The roller massager surface diamond-grade cut small diamond shape and unique 3D "V" type design to fit the whole body tensioning curve. Power Supply - Anti aging facial massager requires one AA batteries (not included ). Vibration frequency: About 6000 times/minute. 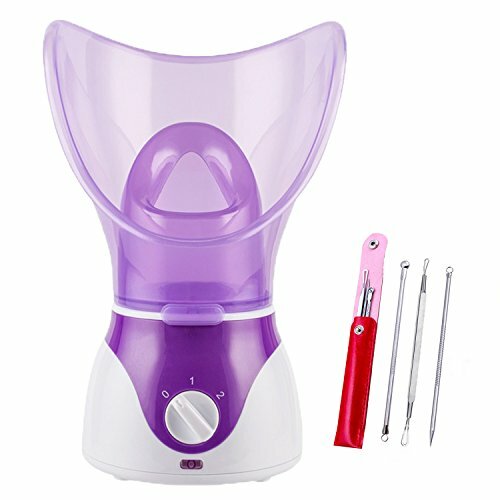 Product Description: Beauty Nymph Face steamer with Steam Inhaler offers all the benefits of a spa steam treatment at home. Featuring a full face mask, the facial sauna uses steam to open up the pores, helping to remove impurities and deeply cleanse the skin,adjustable steam level gives you complete control. 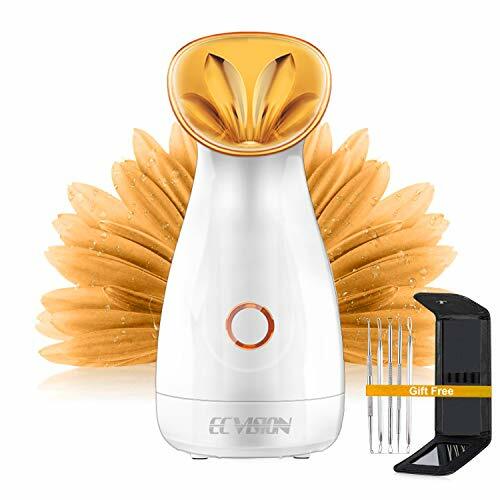 The ECVISION Nano Ionic Facial Steamer can moisturize skin and deeply cleanse pores. The facial atomizer takes personal sauna spa quality skin care with high quality facial hydration system. Blackhead Remover Kit cleaner and more hygienic way than your fingers to Treatment for Blemish zit, acne, blackheads, whiteheads, comedones, and pimples. Tackle all sorts of clogged pores on your face, back, and chest with this 5-in-1 blackhead remover kit. 5 differently sized bottlenecks, needles will help you extract all kinds and sizes of facial flaws with the appropriate tool for a clearer face. Step 1: Place the main unit on a flat surface. Step 2: Fill the water supply tank with water. Step 3: Insert the water supply tank to the facial steamer. Step 4: Plug in the plug into the power outlet. Step 5: Push up the power switch to turn on the facial steamer. Step 6: Direct the steam to your face. The steam temperature is approximate 104 F.The distance between the steamer and face should be 7-8" inches when steaming. A full tank of water can be steamed for about 12 minutes. 1.For skin care: Adjust the nozzle to your preferred spraying angle. The steam is in high temperature, to avoid burning, keep your face at least 25 cm (9.8in) away from the steam outlet. 2.For hair care: Wash your hair before steam.Evenly apply hair mask or the other hair care product after gently wipe the wet hair. Adjust the preferred height of the chair and carefully put your head under the hair-care cap. 3.Aromatherapy diffusing function is provided. Drop a few drops of essential oil on the cotton pad. Open the cover on the pollen box of the nozzle and put the prepared cotton pad. Skin can feel and absorb the fragrance and essence through this special steaming. Dried flowers can be put in the same way. 1.When put the dried flowers or cotton pad into the pollen box, please DO NOT let them block the steamer nozzle. 2.Condensation can cause water to accumulate around the inside rim of the round plastic strap that attaches to the hair-care cap. The water vapour condensation must be drained after each use to avoid the possibility of hot water overflowing that will potentially cause burning. After the water has been emptied, replace the silicone plug and discard the water in the cup. 3.When the appliance is used for the first time, some water may remain around the water supply tank. This is residual water used for inspection in the factory and doesn't cause any sanitation problems. Introducing the True Glow Moisturizing Mist Facial Sauna System - the newest, most thorough way to perfectly cleanse your skin. This sauna system contains everything you need for healthy-looking, glowing skin: a warm steam mist sauna and a facial cleansing brush. The brush includes two attachments - a rotating brush to cleanse and exfoliate skin, and a sponge to apply moisturizer. The nasal cone allows for concentrated steaming and the facial sauna has auto shutoff and timer. Advanced nano technology with good penetrating power and huge spray. High capacity: 15ml water storage can be used about 7 to 8 times. Easy to use: Slide down the lid gently, then the tiniest nanometer particles will penetrate into the basal cell layer of the skin. HOMFUL Nano Ionic Facial Steamer can moisturize skin and deeply cleanse pores. The facial atomizer takes personal sauna spa quality skin care with high quality facial hydration system. 2.Add water (distilled water or purified water only) by the measuring cup. 3.Keep the water volume under max level, close water tank cover. 4.Connect the plug into the power outlet. 5.Touch the button to start steaming. 6.Touch it again to turn off the facial steamer. 1.Cleanse face with warm water, hold a warm washcloth on the face to open up the pores. 2.Wash your hands, disinfect the tool to ensure you don't contract any bacterial infection. 3.According to your requirements, choose a loop, needle or tweezers to extract blackhead, comedone, acne, zit or fat granule etc. 4.Finish the treatment by rinsing your face with cool water and washing your hands with soap. 2.Distilled water or purified water only, keep your face 7-8" inches away when steaming. 3.Do not move the steamer freely during use. 4.It will turn off automatically when the water runs out. 5.Cool the steamer down for 10 minutes after usage, then discard the water in the tank. 6.Normal skin is advise to use twice or three times a week, while sensitive skin is advise to use once a week, do not use over 12 mins, and only use one time for one day. NANOSTEAMER PRO - America's most popular facial steamer just got better. NanoSteamer Pro is a 4-in-1 professional device designed for Spas and skin care professionals. NanoSteamer does this by combining a conventional heating element with a new ultra sonic vaporizer to produce nano steam with negatively charged ionic particles. Nano steam combined with ionic water particles are up to 10x more effective in penetrating skin. AROMATHERAPY CHAMBER - A new warm mist function is now included that should be used to help better open pores immediately. NanoSteamer Pro also includes an all new aromatherapy chamber to add your favorite essential oils for boosted steaming sessions or to simply use as a stand alone aromatherapy device and humidifier. 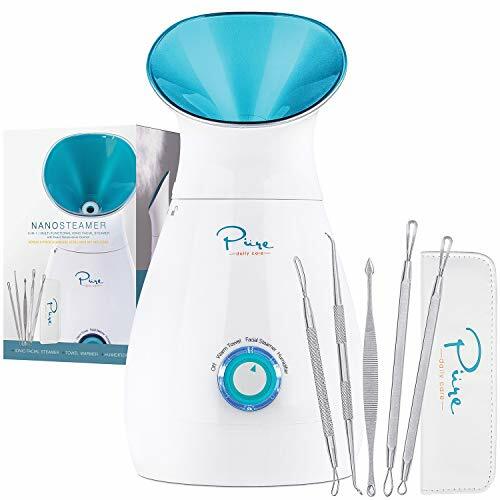 BONUS 4 PIECE SKIN KIT INCLUDED - A Bonus 4 piece surgical grade stainless steel blackhead and blemish extractor kit is included with every Nanosteamer. This kit includes 5 precise instruments that compliment your Nanosteamer perfectly. Followup your steaming session by using this kit to remove blackheads and blemishes effortlessly for perfect skin after every use. MORE POWERFUL WITH MORE FEATURES - NanoSteamer Pro produces 3x as much steam as the original NanoSteamer. It also includes a larger water reservoir for longer steam time. A 3X maginifcation mirror is built into the top lid to give you a zoomed view of your facial skin so you can target blackheads and other impurities with more precision. No Worry Anymore! LONOVE Facial Steamer is designed to gives you hydrated skin and a glowing complexion! 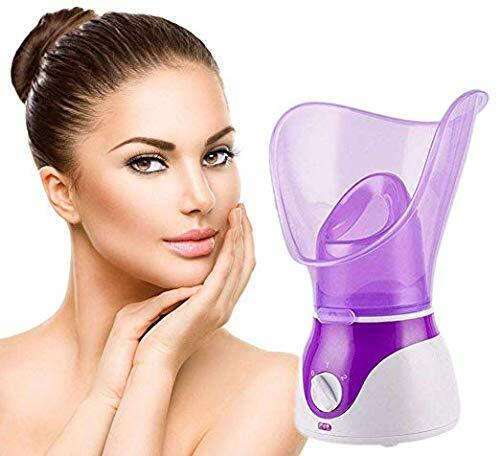  No Plastic Smell, Healthy Skin Care Face Steamer. Our face steamer ionic bpa free designed with patented inner UV disinfection system sterilizes the nano-mist before it comes out the nozzle, making sure the steam is 100% clean and reaches your skin in the purest and most effective condition. When in first use, it will have a new plastic smell, please don't worry, it is normal and it will disappear a few times of steaming. 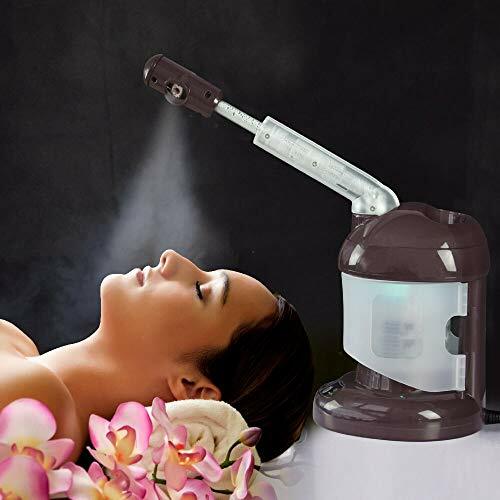  Upgraded Nano Steam Tech,Professional Facial Treatment. 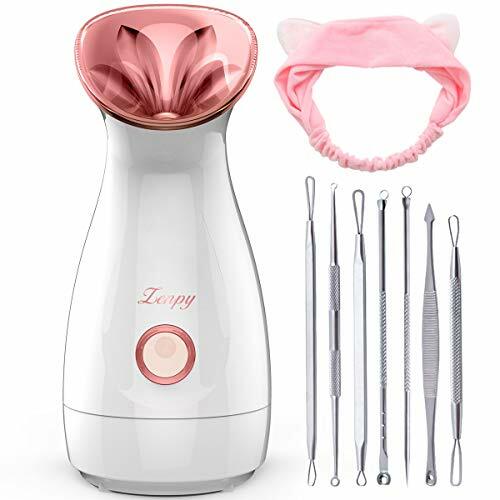 LONOVE facial steamer home facial designed with EXCLUSIVE Atomizing Lamp and new sonic atomizer to produce nano steam with negatively charged ionic particles.Nano steam combined with ionic water particles are up to 10x more effective in penetrating skin. It can unblock your pores and improve your skin tone, that is non-invasive and even relaxing!That means you can enjoy professional facial SPA at home or even in travel! 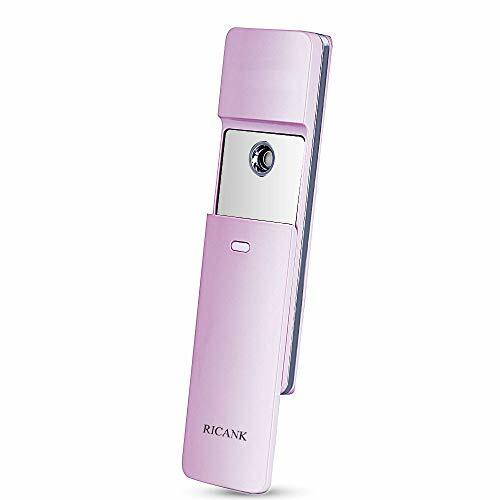  10 Times Penetration than Regular Steam The normal steamer produce water vapor instead of nano ionic mist, which can only add water on your face surface,can not penetrate deep into pores. 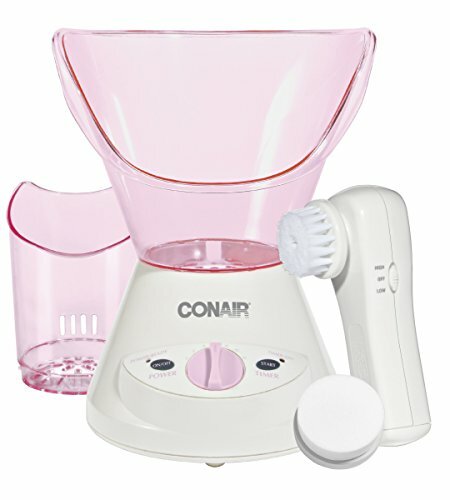 While LONOVE facial steamer breaks down water into nano particles, up to to 10 times more effective at penetrating your skin, meaning you enhance your blood circulation by as much as 10 times, improve your skin cell functions and help to retain your youthful complexion.GET ONE HOME AND STEAM YOUR BEAUTY NOW! Nano mister sprays the finest neutral water particles. Daily use of the mister as a moisturizer will keep dry skin hydrated throughout the day. For those with oily skin, misting your face ordinarily can help balance out oil production and keep skin feeling fresh. 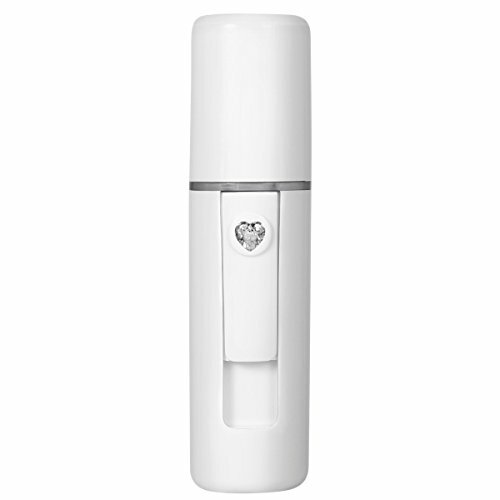 Due to its finest mist, Zenpy Nano Misters are favoured by beauty editors and makeup artists. It can be used as a moisturizer, to set makeup, or to refresh your look on the go. Considering its handy size, any one can carry it in purse as must-have daily essentials. 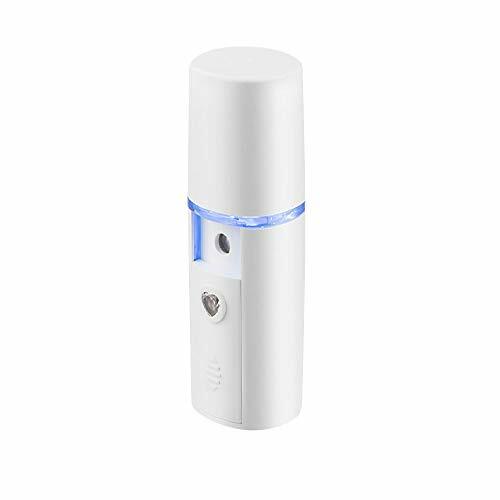 Zenpy Nano mister sprays a cool mist that gives you heavenly comfort when in a hot environment. From stuffy offices to crowded buses, in humid weathers or post yoga class, it cools you down with its cool and soothing mist. It is also highly recommended by pregnant and menopausal women to fight hot flashes and increased body temperature. Are you tired from sitting at your desk all day? Whenever the mid-afternoon slump hits you in the library or at the office, spritz your face with Zenpy Nano Mister, you will feel cooling and refreshed just like hearing a wake-up call. Helps transform dull, dry skin into refreshed, healthy-looking skin.Nano cool mist moistens and soothes tired skin instantly, leaving skin soft and supple, great to relieve dryness from heated or cooled place. Convenient to carry in the pocket for sleek design. can replenish water for your face,your hair,and your body whenever and wherever. What does it have to do with eyelash extensions ?--- Nano mister can keep down fumes from eyelash extensions glue when you finish up artificial lash extensions. Features: 1.The nano mister sprays the finest mist that moisturizes skin instantly. Daily use of the nano facial mister will keep your dry skin hydrated throughout the day, you can feel yourself like have done a facial spa after a 20seconds spray. 2.The handy nano mister is so convenient for you to nurse your skin everywhere, design mini, like a lipstick, which fits your handbag or pocket, enjoy a facial steamer spa anywhere you want. 3.Due to the finest mist, the facial nano mister can be used as a moisturizer to set makeup, or to help eyelash extensions. 4.The face nano mister produces a cool mist, it really helps to refresh and relax your mind for a long time working or studying. Also for all seasons using, cools your down at hot summer and stay hydrated at dry winter. 0.0001mm Fine Mist - Ultrasonic vibration technique decomposes the moisture to 0.0001mm. Much finer mist can be absorbed instantly, moisturizes your skin deeply, won't ruin your makeup, and helps the eyelash extension adhesive cure faster. 8ml For A Whole Day - 8ml capacity for 40 times use, 20 seconds each time , exactly enough for a day. The tank is separated and easy to clean. We also provided a 18ml injector bottle for refill. Note: Please use mineral water or purified water instead of essential oil and toning lotion. The Smallest Mister - Lipstick shape design and weights only 35g. This nano facial mister is the smallest on the market. Portable and convenient to carry in your handbag or pocket. Classic Design - The shape of the nano face mister is just like a lipstick, glossy surface in noble black. It really shows your taste when you using it. The package is stylish. Perfect gift for Women, Birthday, Valentine's day, Girlfriend, Wife, Christmas, etc. USB Recharge - The face nano mister is rechargeable. A full charge supports up to one-week. No battery needed, USB cable is provided. Brand: Soundance | Manufacturer: Shen Zhen Feng Ge Pai Co., Ltd.
Nano-ionic Facial Steamer Compared to normal facial steamers, Nano-ionic steam can penetrate and moisturize your skin 10 times more effectively. Meanwhile, the warm mist can help to unclog pores, reduces acne and blackheads, and provide a quick nutritional-absorption for your skin. 20s Full-Powered Steam: The home facial steamer generates full-powered steam within 20 seconds with 1 touch on the button. You can have a relaxing steaming time with consistent mist for 8-10 minutes. 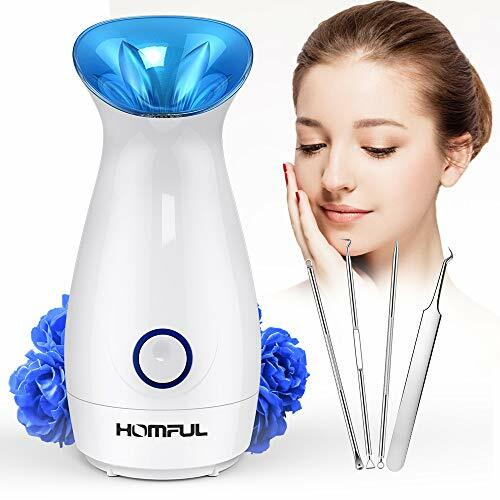 Multifunctional Full Face Steamer Our facial steamer can not only moisturize dry skin by replenishing moisture, quickly opening pores and fully absorbing nutrients, but also relieve the symptoms of sinusitis and remove congestion in the sinuses. Eco-friendly Material This face steamer has been certified by CE, ROHS & FDA. Using environmentally friendly materials, it is ABS high-temperature flame resistant, without safety hazard. 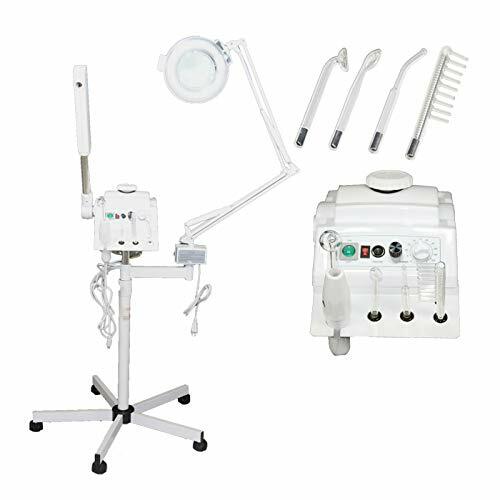 What You Can Get Facial Steamer x1, Measuring Cup x1, 4 PCS Skin Care Kit x1, White Hair Band x1, Face Mask Brush x2. With this kit, your daily skin care can be easier and more convenient! Use this Nano cool mist moistens Steamer to moisturize and refresh your eyeballs, face, hair and your tired skin instantly. Leaving skin soft and supple, reduce wrinkles, or relieve minor irritations. Nano mister has cooling function which shrinks the pores and makes skin firmer. Provide the necessary humidity to help you set and refresh your make-up. Simply sliding down the switch to release a refreshing mist in just moments. It stops in 60 seconds automatically, enabling skin to get a sustainable moisture replenishment. 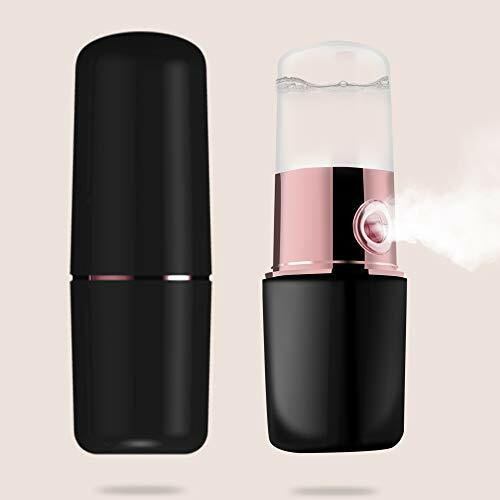 Facial mist spray face sprayer for eyelash extensions beauty skin care machine, produces the finest ionic mist spray that moisturizes without damaging your makeup for a refreshing lift any time. USB Rechargeable Design can be connected to computer or phone adaptor for charging. 1.Before using the steamer for the first time, please let it run with a full tank of water with a few drops of lemonade. 2.When adding water, please gently pull out the water tank vertically from the back of the steamer, and then twist off the round lid at the bottom of the tank to fill water. 3. The distance between the steamer and face should be 7-8" inches (20cm) when steaming. A full tank of water can be steamed for about 8~10 minutes. Nano cool mist moistens and soothes tired skin instantly, leaving skin soft and supple, great to relieve dryness from heated or cooled place. Portable atomization sprayer can better improve the skin absorption for water and nutritious components of the lotion. Stylish, compact and sleek design. Simply slide the cover gently out of the way to release a refreshing mist in just moments. Use on normal, oily, dry, combination and sensitive skin types, help skin recover to a tender younger and healthier condition. USB charging and allow for putting it in your handbag convenient to carry anywhere at any time. If you're following a strict skincare regimen, it probably looks something like this: cleanse, exfoliate, tone, moisturize, apply sunscreen and apply a weekly face mask. Sound familiar? Well the good news is that you're doing a wonderful job taking care of your skin, but there's one more important step you should consider adding to your routine that has amazing overall benefits to your skin's health and can improve the effectiveness of some of the steps mentioned above: facial steaming. Why Facial Steaming Is Important! 2.It makes your skin more receptive to other skincare treatments. Kinsteam nano steam uses the Advanced PTC technology turns clean water into micro-fine particles to produce a more powerful and consistent mist, 100 X more effectively in penetrating skin. 80ml water tank allows for 15 minutes working, This is the optimal facial hydration time which allows every pore on your face todrinkenough water!